The following timeline details the Ancient Egyptian Dynasties, Periods and Kingdoms with their relevant dates in chronological order. This timeline of Ancient Egyptian Dynasties provides an overview of the history and time span relating to the periods, kingdoms and Ancient Egyptian Dynasties. Definition of Ancient Egyptian Periods: An interval of time characterized by the prevalence of a specified culture, ideology and technology regarded as a distinct evolutionary or developmental phase in Egypt. Definition of Ancient Egyptian Kingdoms: The Ancient Egyptian Kingdoms were politically organized communities with a monarchical form of government headed by a king or queen who became known as Pharaohs. Definition of Ancient Egyptian Dynasties: The Egyptian dynasties were families which retained political power across generations providing a succession of kings, or Pharaohs who were usually related. 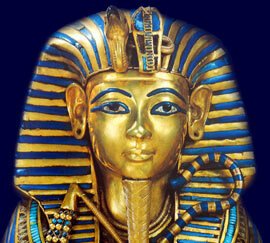 Egyptologists divide the history of the Ancient Egyptians into 31 dynasties up to the arrival of Alexander the Great. Definition of Intermediate periods in Ancient Egyptian history: There is considerable confusion regarding dates in Egyptian history as the Egyptians had a different method of recording dates and the Egyptian calendar was reset to year one at the start of each Pharaoh's rule. The intermediate periods refer to the time between the end of an old period or Kingdom to the start of a new period or Kingdom, allowing for possible anomalies. The following timeline provides a time driven list Ancient Egyptian periods, kingdoms and dynasties provide the generally accepted dates of each of these times. A chronology or list of dates of all the periods, kingdoms and Ancient Egyptian Dynasties. Facts and information via the Ancient Egyptian Dynasties timeline. The Ancient Egyptian Dynasties details the important people and events, via a simple timeline, charting the key dates in Ancient Egyptian history.